Dekhistan (another name – Mashad Misrian) – ancient town in Balkan region of Turkmenistan. Dekhistan was found at the end of the III century B.C. and blossomed out during the governing of the dynasty of the Khorezmshakhs; it was destroyed by the Mongols, then it again revived. Dekhistan existed approximately till the XIV century A.D. Dekhistan is considered the most important medieval oasis in the southwestern part of Turkmenistan. The whole area of the town was about 200 ha., and the double ring of the walls defended it. Many ruins of different constructions that reached till our days indicate its former greatness. 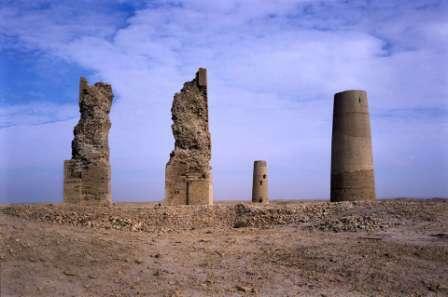 As many towns of this epoch, Dekhistan was divided at well- reinforced “shakhristan” with the citadel and “rabat”. The famous mausoleum Shir-Kabir, two minarets of 25 meters high, portal of the mosque, remains of adobe clay town blocks, ruins of caravanserais and the mausoleum on the necropolis Mashad remained. Some caravanserais, situated around the settlement behind the fortress wall, mean the location of several town gates, which point the direction of caravan routes from the town. There was also a madrassah, unique among famous one in Turkmenistan, which refers to the premongolian period. The distinguishing characteristic of the settlement is the abundance of the faience products with ornamental and topical painting. Bronze kettles, lamps, other metal products with art handling, glass products were also found. The high level of development of town culture in Dekhistan points at its improvement. It is known, that there were systems of water supply and sewerage, baths, pavements and etc. 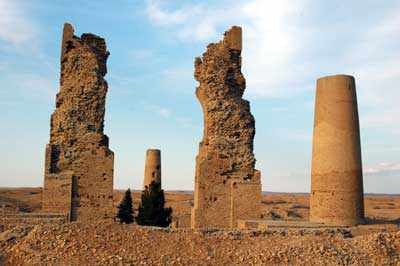 Today the town is almost destroyed, and the majority of its constructions are covered with sands of deserts, but in view of the fact that the famous poem of Firdousi “Shakhname” was written here, the town is of great historical and cultural value. Highly developed fortification, art advantages, operating techniques and number of monumental monuments of Dekhistan put this provincial region in one row with such capital centers of town life of medieval as Merv and Gurgandj.